 Analysis of "Paris Street, Rainy Day"
Influenced by the traditions of academic art promoted by the Ecole des Beaux-Arts, where he trained under Leon Bonnat (1833-1922), Gustave Caillebotte belonged to the realist wing of the Impressionist movement. Thus he was more drawn to the style of Manet (1830-83) and Degas (1834-1917) than that of Monet, Renoir or Pissarro. His realist painting gave him a natural feel for modern art, especially since, like his predecessors Jean-Francois Millet (1814-75) and Gustave Courbet (1819-77), he sought to paint the world as it existed, rather than as it should be. However, it is worth noting that his style could vary considerably. Thus works like La Place Saint-Augustin, Foggy Weather (1878, Private Collection), are considerably more impressionistic than Young Man at His Window (1875, Private Collection) or The Floor Scrapers (1875, Musee d'Orsay). As well as producing a number of outstanding modern paintings, the wealthy Caillebotte also acted as an unofficial patron to his fellow artists by buying a large number of Impressionist paintings and making gifts of money where needed. Some of the works he purchased, included: The Balcony (1868-9) by Manet; Dance at Le Moulin de la Galette (1876) and The Swing (1876) by Renoir; The Red Roofs (1877) and the Vegetable Garden with Trees in Blossom, Spring, Pontoise (1877) by Pissarro. NOTE: For the full story behind Impressionism and the small group of Parisian painters who created it, see our 10-part series, beginning: Impressionism: Origins, Influences. In this masterpiece, Caillebotte imparts an unusual monumentality and compositional virtuosity to the sort of typical everyday scene favoured by Impressionists - in this case, the bold new boulevards introduced by Baron Haussmann (1809-91) that transformed the Paris landscape. The effect is both real and contrived, casual and choreographed. His curiously detached figures reflect the anonymity engendered by the boulevards, while the vista chosen accentuates the huge scale of the architectural development which dwarfs the human figures it surrounds. Many of these figures appear isolated and absorbed in their own thoughts, their expressions downcast, while they seem to be hurrying rather than strolling. The picture's cropped look and photo-realistic effect adds to its 'modern look'. Note also that although it is associated with the school of Impressionism, "Paris Street, Rainy Day" is characterized more by its realism and reliance on line, rather than the typically loose brushwork of the Impressionist idiom. For more background, please see: Characteristics of Impressionism (1870-1930) and Realism to Impressionism (1830-1900). The work depicts a number of pedestrians in the Place de Dublin seen from the eastern side of the Rue de Turin, looking north toward the intersection of the rue de Moscou (left), the rue Clapeyron (centre), and the rue de Saint-Petersbourg which crosses left to right. 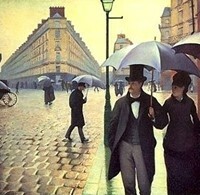 The layout of the roads and buildings allows Caillebotte to use two-point perspective. Judging by the light, the scene is set on a winter's afternoon. The main focus of the composition is a middle-class couple with an umbrella, each dressed in the latest Parisian fashion. She wears a fur lined coat, with hat and veil; while he wears a top hat, frock coat with upturned collar, bow tie and waistcoat. In the background a mixture of bourgeois and working class pedestrians are visible. In addition to the imposing architecture of the buildings, the other defining feature of the picture are the umbrellas carried by many of the people on the streets. According to some art critics, these umbrellas shield their owners not just from the rain, but, also from other passers by. Like his Impressionist colleague Degas, Caillebotte was strongly influenced by the new art of photography, as is evident from the way the picture is cropped, making it seem as if the artist had taken a snapshot of people going about their daily business. In fact, like Degas, Caillebotte spent a great deal of time meticulously positioning his figures throughout the picture. The latter itself is divided into two halves horizontally, by the lamp post; and vertically by the buildings above and the expanse of cobbled street below. Displayed at the third of the Impressionist exhibitions, held in April 1877, "Paris Street, Rainy Day" was kept within the family until the mid-twentieth century. In 1955 it was purchased by Walter P. Chrysler Jr., who in 1964 resold it to the Art Institute of Chicago.  The Road-Menders, Rue de Berne (1878) by Manet.  A Bar at the Folies-Bergere (1882) by Manet.  A Sunday Afternoon on the Island of La Grande Jatte (1884-6) by Seurat.  Woman Combing Her Hair (1887-90) by Degas.  For analysis of other Impressionist genre pictures, see: Homepage.